Deutsche Windtechnik – Europe's leading independent provider of maintenance for wind turbines with over 1,100 employees – and some of its customers are using the Hamburg WindEnergy 2018 trade fair (25-28.09.2018) to sign several long-term service contracts. Maintenance contracts for a total capacity of 56 MW were signed at the start of the fair, and further cooperation agreements will follow during the coming days. "We are seeing once again this year that the combination of continuously increasing system competence together with the broad range of areas we have expertise in are a real advantage for our customers when it comes to selecting the right level of service," Matthias Brandt, Board Director at Deutsche Windtechnik said. "Our growing presence in countries throughout Europe and North America is also becoming more important for larger international customers. It enables us to develop maintenance concepts that not only cover multiple brands but also span multiple countries, onshore as well as offshore. This further increases the synergy effects. Working together with Deutsch Windtechnik opens up completely new opportunities for many large operators." Right at the beginning of the fair, Deutsche Windtechnik AG successfully concluded a full maintenance contract, including large components, for the Sailershäuser Wald wind farm. Stakeholders in the citizens' wind farm include Planet energy GmbH, a wholly-owned subsidiary of Greenpeace Energy eG, and Städtische Betriebe Haßfurt GmbH, which are also responsible for operational management. Deutsche Windtechnik will take over maintenance for the ten Nordex N 117 turbines immediately after the warranty period expires, and the contract term is 18 years. "We have been working successfully with Deutsche Windtechnik since 2015. 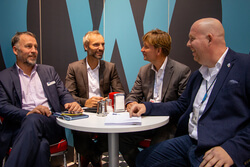 We have no doubt that independent service providers such as Deutsche Windtechnik enrich the competition in the service market as a whole and provide an important alternative to service by the manufacturer," said Julian Tiencken, project manager and authorised representative of Planet energy GmbH. Also on Tuesday, Deutsche Windtechnik and the project developer and operator Saxovent Ökologische Investments GmbH & Co. KG, which has its headquarters in Berlin, agreed on a full service contract including large components for ten Vestas V90 turbines installed at the Große-Welle and Crussow wind farms. "The long-standing cooperation between Saxovent and Deutsche Windtechnik has developed into a stable and proven partnership. Together, we are developing the right maintenance solutions for individual wind farm requirements," said Saxovent founder and managing director Carsten Paatsch. Another contract for nine AN Bonus 1300 turbines was also signed at the trade fair. Germany's Deutsche Windtechnik is gaining wider recognition with operators as well as investors, because their experts are able to work with many brands.